Vicious fights! Stunning beauties! Surprises around every corner! Yes, it's reality TV but with a lot more depth - as much as 10,000 feet (3,048 meters). It's live coverage of deep-sea exploration off the northeastern United States and tens of thousands of people are tuning in. They're watching an eel suddenly attack a squid, oohing-and-aahing over hot pink starfish and listening as excited researchers discover a canyon so downright alien that sea life lives on methane escaping from the sea floor instead of sunlight. They're watching science as it happens, however weird and wild. "We've been calling it Deep Sea TV," says National Marine Fisheries Services scientist Martha Nizinski, in a ship-to-shore interview. "It's much better than any other reality show being broadcast." 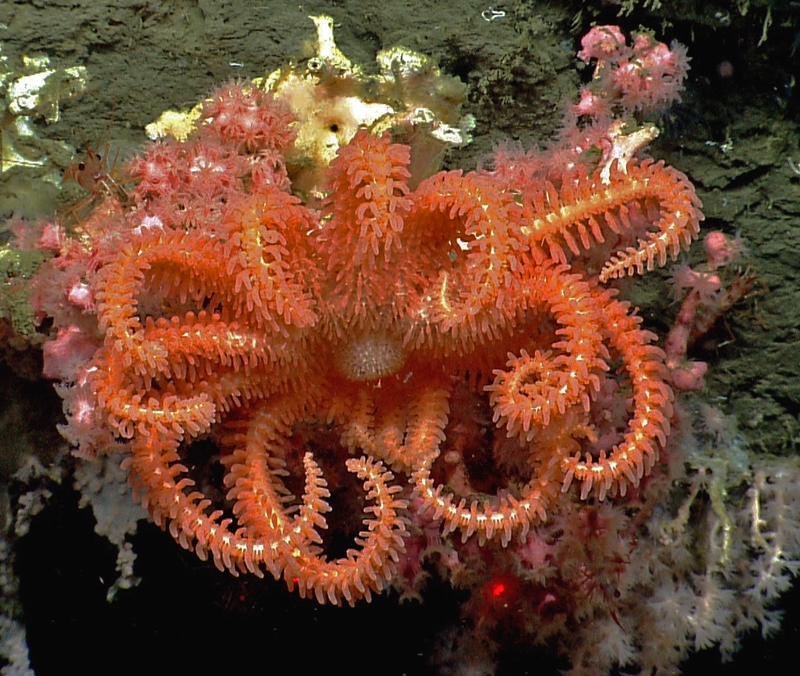 For years, the world of the deep sea floor has mostly been the province of scientists. A handful of researchers would huddle on a ship and watch the video from below, take notes, and two or three years later write a scientific paper. Now, as the National Oceanic and Atmospheric Administration's ship Okeanos Explorer and its robotic submarine explore thousands of feet deep, the view is broadcast live, usually from 8:30 a.m. to 4:30 p.m. EDT, for other scientists and everyday people to follow along to the tune of 50,000 visits. Leona McKinney of Hiram, Georgia, started watching from home over three weeks ago. "I've watched every day since then. In fact, I'm watching now. I'm hooked on it," she said in a phone interview Wednesday. The expedition, which costs about $40,000 a day, continues until Aug. 16. As the robotic sub roams the Atlantic Ocean off Massachusetts, scientists can call in or send messages with requests to see this or that. In past years, the ship explored the Pacific Ocean, but the next several missions will be off the East Coast with officials considering a deep Puerto Rico trench dive in the winter -with live coverage, of course. Aboard the ship, researchers do more than watch; they explain the science and the action for viewers. "It's a bit like color commentary from sports," says U.S. Geological Survey scientist Amanda Demopoulos, whose voice is often heard calling the underwater action. "These are mysterious ecosystems. We don't always know what we're going to find." The expedition seems to be gaining loyal viewers, Nizinski said. "We're giving everybody a really good diversion and keeping them from doing their work," she said. On the ship's Facebook page, comments from viewers include raves from McKinney, who's become a fan of some of the commentators. "I love it when they say 'Ooh, I haven't seen that before'," McKinney said. One of the highlights for her: Watching an eel circle an unsuspecting squid, attack and bite its would-be-lunch. The squid played dead and then suddenly escaped. It's that sense of surprise that makes the ocean view more compelling to him than the Kardashians, said NOAA's acting chief of exploration John McDonough. "It's a reality show, but it's more real than reality. You don't know what you're going to witness in one of those dives."